Like many great ideas, the new Vera Haile Senior Housing project in San Francisco began with one simple need: to expand the dining room for the St. Anthony Foundation. Since 1950, the organization has helped San Francisco’s homeless and poor population in the Tenderloin. St. Anthony’s modest goal quickly grew into plans for a new, affordable, safe and welcoming 10-story apartment community. 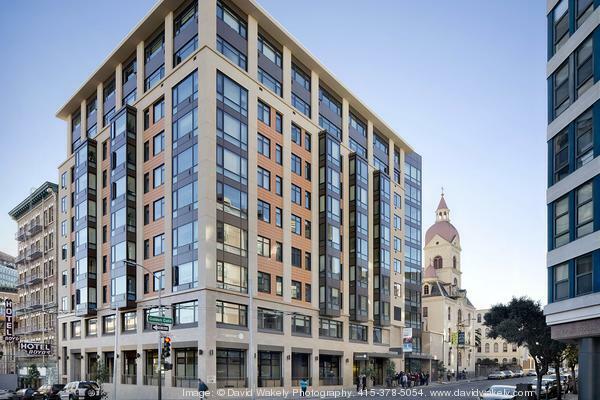 The 90-unit affordable senior housing project by Mercy Housing California at 121 Golden Gate Ave. in San Francisco includes a rebuilt St. Anthony’s Dining Room, its new work center and clothing program. The building includes the rebuilt St. Anthony’s Dining Room, its new social work center and clothing program, and Mercy Housing’s 90 units of affordable housing above it. The rental project has 43 studios, 46 one bedrooms, and a two-bedroom for very low-income people age 62 or older. Getting the project to that point was no small matter. The challenge was to fit all of St. Anthony’s needs into the building with the housing. That includes finding space for community and open spaces on an 11,000-square-foot site and under the 100-foot height limit. Sharon Christen, the project lead at Mercy Housing, said bringing together so many variables for such a highly specialized population required a lot of flexibility. “There were many twists and turns. St. Anthony’s development changed a little over time, the dining room was always a constant, but the other services they would provide and how much area they needed to provide their services changed,” she said. But the two nonprofits worked together to create individual building systems for maximum control, autonomy, and utility for each owner. The owners mutually selected the contractor and architect, determined how to split costs, pursued the building permits, negotiated an agreement for the shared spaces, and coordinated financing and construction loan closing to cooperatively build the $64 million project. “What is significant and special is that two developers with complicated building programs, complicated financing structures found a way to make it work,” said Christen. In moments during the process when re-configurations were needed, good communication was key, said Christen. “We had a very good working relationship with St. Anthony’s,” she said. Mercy’s housing development was financed using a mix of funding including federal and city dollars as well as low-income tax credits. By using those resources wisely, the developers were able to find a way for residents to pay just 30 percent of their income for rent and utilities with 18 units serving formerly homeless seniors. St. Anthony’s financed its dining room and social work center through new markets tax credits and private donations.